Most of the THP readers, know that I have a problem. My problem is that I am obsessed with Golf Shoes. For years I was brand loyal, but once I ventured out in the world and tried others, I realized exactly what I had been missing. When it comes to golf shoes finding a pair that has a great fit and a great look can be hard to do sometimes. Since venturing out I have found that quite a few brands really work well for me. In the past however Etonic Golf Shoes never did. It was nothing against the shoe really, the look was just never for me and something about the fit just did not seem right for my feet. We get a lot of requests for reviews at The Hackers Paradise, but when it comes to shoes we were surprised with just how many we received for the Etonics label. Because of that we reached out to the company and were extremely happy when they started telling us about one of their lines that was new for 2009. The Etonic Stabilizer is considered their “flagship model” and is the shoe for the “frequent golfer”. According to the information they gave us, there is a whole lot of research and technology associated with these shoes and they were happy to share it with us. Inside-Out Spike Placement strategically positions spikes to both accept and transfer the forces generated during a golf swing to maximize traction, stability and balance. PowerSpike was created in conjunction with SoftSpikes and features a center stud that works in harmony with the cleatâ€™s eight vertical sidewalls to provide a 25 percent increase in traction. PowerPod is positioned under the arch area in each shoe to provide additional arch support and traction during the drive, impact and follow through phases of the swing. PowerPlay Flex Zone allows the shoe to flex precisely with the foot, keeping the outsole connected to the ground longer for improved traction, stability and balance. Dynamic Reaction Plate promotes stability and balance by assisting in preventing the foot from rolling outward during back swing and follow through. Stabilizer Heel Technology shapes the midsole and outsole platform to provide optimum platform stability and motion control during the swing. After speaking with Etonic for a little while they offered to send over a couple of sample pairs for us to try out and do a review on. Within a couple of days two pairs of shoes arrived and once we opened the box we understood exactly what they were speaking to us about. These shoes look different than most of the other Etonics that I have tried on in the past. They were simple yet slightly different and definitely striking. They had a couple of things that really got me excited about them before ever trying them on. 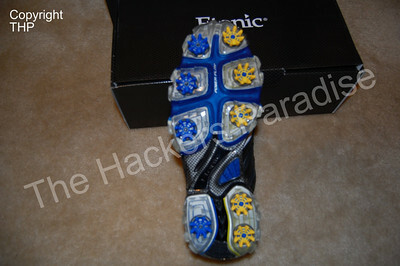 The first thing is a thank you to Etonic for using real laces in their golf shoes. For the love of me, I cannot understand how anybody can like those thin laces that are like wires that some companies use. The second thing that got me excited about them is the bottom of the shoe. 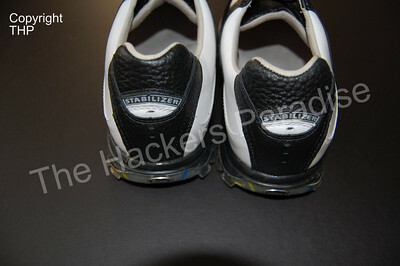 It looks more like a motherboard than it does a golf shoe. You can tell there is a significant amount of technology behind them and we will soon be able to find out if the research paid off. We were armed with two pairs, a black pair and a brown pair and we were eager to get them out on the course. Myself and THP resident pro Andy M. put them on and headed to course to hit balls and play 18 holes with our new found footwear. Once on the range we settled in with our new shoes. I really enjoyed the comfort and did not need any “break in” time as they fit like a glove. Andy loved the support but was struggling with one of the shoes being a little too tight. We finished hitting balls on the range and while waiting to tee off shared some thoughts. The “grip” that these shoes provide on the grass is possibly the best we have encountered. No slipping whatsoever and we were hitting on grass that was quite wet. He also noticed that after a little while the shoes were broken in he had the same comfort I was enjoying. We played 18 holes and afterward continued to wear them during lunch in the club house. Both of us remarked at how comfortable they were and how they held up on the course. It rained the day before we played and the grass was definitely wet the entire day. Not once did either one of us slip and we also never encountered any wetness getting through the shoes the entire day. As someone that is very passionate about their golf shoes, this one seemed like a keeper. 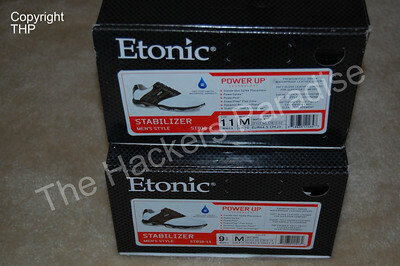 Overall, the Etonic Stabilizer impressed us quite a bit. 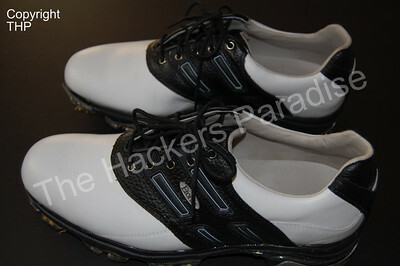 When The Hackers Paradise reviews golf shoes we look for a few things that are what we consider “must have”. 1. Comfort – These had that covered. No foot exhaustion at all and we have had no issues in the weeks since receiving these to try out. 2. Style – The Etonic Stabilizer is a great looking traditional shoe. 3. Price Point – The MSRP is $159.99 but we were able to find them in stores for $20-$30 less than that. At $160 we really liked them. At less than that, we love them. Durability is another thing we look at but due to time restraints it is very hard to cover that aspect. But we can tell you in the three weeks we have had them, they have been perfect. We strongly recommend people taking a hard look at these the next time they are in the market for golf shoes. With the support and comfort involved, they are ideal for someone that walks a course and can suffer from their feet getting tired. 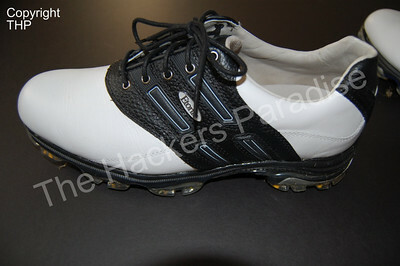 You can read more about this shoe at Etonic Golf Shoes. Etonic golf shoes can be found at retailers everywhere and many online stores. Very cool shoes. I have Etonics and love them. Never really looked at Etonics much but with this writing, I will have to give them a shot. Very nice looking and comfort is the key. I love Etonic, still have an old pair which was from their first run of non-metal spikes! So after reading this earlier this morning, I decided to stop and check them out on my lunch break. No lie, they are really that comfortable. Thanks for the write up. Good review. I will have to check these out. Great coverage. Love your insane value of golf shoes. I have a similar problem and also did not consider Etonics. Will have to try some on. Great coverage. ike the others have said, I have not really tried Etonics in a while and now will have to go check them out. Very strong looking shoe. These shoes look good. The technology used in the soles sounds very interesting. I’ll look into these when I’m buying shoes later. After reading this, a few days ago I went and bought these shoes. Good review and I am thrilled with them. I love my Etonics. Found this site by googling them, which is pretty cool. Has anyone found where you can get replacement powerspikes for these?? I love the shoes and the spikes, but have not found even a mention of replacement spikes when searching the net. I know that any fasttwist softspike will fit these, but wouldn’t it be nice to be able to replace with the original powerspike? They wouldn’t dare have made a shoe without a replacement spike, would they?????? fantastic advice. I’m going to article a link of this podcast on my blackboard web page for my students. Every thing you said operates for discussion boards too. Numerous !